When assessing job candidates, a manager is trying to predict which candidate will perform best in a specific role. It makes sense therefore to use a selection process that will give an optimum prediction and it should come as no surprise that a thirty minute friendly chat and other ‘light’ selection methods come well down on the effective prediction league table. Given this fundamental requirement to predict and given that some selection tools may work better than others, is there a ‘best’ selection process for all jobs? The simple answer is no. Each selection process must be designed for the selection task in hand but this blog gives some guidelines for a generic process that can then be varied as needed. Most organisations begin the recruitment, search and selection process with a discussion about requirements with a recruitment consultant. This presumes that the organisation has put in place a three step activity to develop the person specification and that the person specification reflects the true competencies needed. The three step process should begin with a comprehensive job analysis considering the proposed job in the context of all other jobs in the organisation. From this analysis comes a job description and from the job description comes the person specification. With the person specification in hand, the recruitment consultant can begin the search phase. The search phase objective is to offer a pool of viable candidates to go forward to the selection phase. The aim of the selection phase is to predict which of the pool will perform best when actually in the job. And to design a selection process we need to understand the prediction capabilities of each of the possible selection instruments that we might use. A selection instrument is simply a test or a formal interview or other discrete activity that, done together, makes up the selection process that all the candidates will be put through. At the top of the prediction effectiveness list is the aptitude test and generally a number of aptitude tests such as abstract reasoning, verbal reasoning and numerical reasoning are completed by each candidate. We measure the prediction effectiveness of these instruments on a scale of 0 to 1. Prediction instruments with values towards zero are poor predictors of future job performance and those with values around 0.5 are considered moderate to good. Aptitude tests and other tests of cognitive ability score around 0.5. Also at the top of the prediction effectiveness list comes work sample tests. These are tests of key task competencies that the candidates would be expected to hold to be effective on the job. For a carpet fitter a suitable work sample test might be to fit underlay, carpet and vinyl in a small test area whilst being observed, and demonstrating some of the key skills using adhesives and tools. These tests must be designed specifically to test competencies set out in the person specification. Correctly designed work sample tests score just over 0.5 and are considered again moderate to good predictors of job performance. 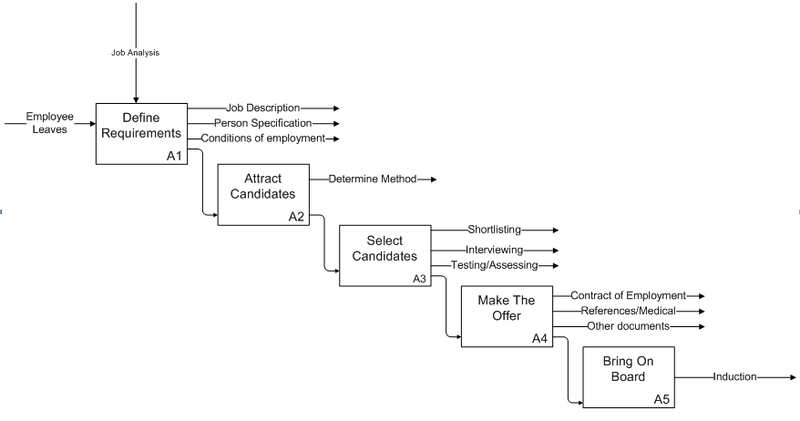 On a par with aptitude testing and work sample testing is the structured interview. The structured interview is developed directly from the job description and person specification and seeks evidence from the candidate that the required competencies are present. Interviewing is a skilled activity that begins with the development of questions and expected valid answers and continues on the day to score each candidate on their responses. Further down the league table of selection instruments comes the personality inventory. A person’s personality is typically defined by their tendency to exhibit the so-called five personality factors: extroversion, openness to experience, agreeableness, conscientiousness and emotional stability. ‘Conscientiousness’ is a moderate predictor of future job performance for all jobs and for specific job types, ‘openness to experience’ is essential. The personality inventory scores around 0.4 on the scale. Personality inventories are also used to assess how well someone will fit in a role and organisation, but here we’re focussing on the ability of the instrument to predict future performance rather than fit. So what of the rest of the things which managers often do to select future staff? Simple statements of job experience and job knowledge score low. References are also low, though they are essential in checking that the candidate is who you think they are. Unstructured interviews also score moderate to low as predictors. And at the bottom of the pile comes graphology or handwriting testing which scores around 0.01 and which is pretty useless for anything. So if we’re looking for a generic best-practice set of instruments then we might look no further than a combination of aptitude tests, personality inventories, work sample tests and the structured interview. Together they provide what occupational psychologists call good predictive validity. The nature of what exactly is tested, what questions are asked and how the inventories and scores should be interpreted are for the HR consultant and the manager. For many roles these four are augmented by other specific activities to add further to the prediction. There’s still a chance of course that the person to whom the job is offered will have problems but that chance is much reduced if the process from job analysis to selection instruments is followed diligently as we’ve outlined here. Should you be interested in talking further about selection or should you want us to help you with recruitment and selection, do call us. TimelessTime is not a recruitment or search agency and we value our independence from the search activity. We have relationships with many recruitment consultants who have significant experience in working from person specification to candidate pool and we can manage the recruitment activity for any client to give a joined-up activity from job analysis to job offer. You might be interested in our recruitment case studies.